Knickernappies Sighting: Reviews and Giveaways, Check them out! Fabulous and totally unexpected review over at Mommy Burgh's Blog! It is just the coolest thing to find accurate and in depth reviews by customers who sincerely love our products and who've written a thorough review. Mommy Burgh has posted a great review of the Knickernappies OS diaper with absolutely adorable photos of her little cutie Kirsten modeling it! Please head on over and check little Kirsten out and read her mommy's fabulous review! Oh and become a follower too while you're there! 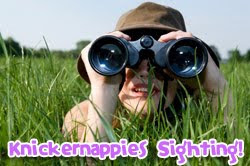 Interested in winning a Knickernappies 2G Pocket Diaper w/ Inserts? 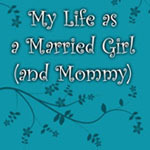 Stop by Katrina's Blog, My Life as a Married Girl, read her review of the 2G diaper and enter her giveaway! Giveaway is sponsored by Knickernappies and ends May 10th. The winner will receive a Knickernappies 2G Pocket Diaper w/ LoopyDo Insert in the size and color of their choice! Good Luck! Want to see one of the cutest Custom Knickernapppies? CrunchyCupcakes Blog shows Kadie in her adorable custom Knickernappies, dalmation print with velour inner. Super cute and super luxurious! Do you have Knickernappies sighting to share? Comment and let us know so we can check it out! Love it! Thanks!!!! We are washing our diaper now so we can use it again!!! !